It's been almost a year since we launched weheartmacandcheese.com and I'd yet to attempt a recipe using the main ingredient of my nom de fromage, Havarti cheese. It seemed the time was nigh. 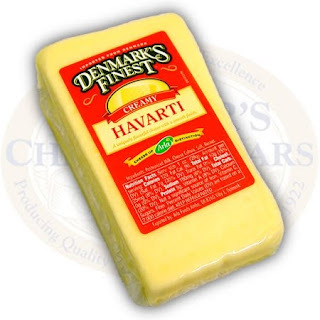 Havarti, a semi-soft Danish cow's milk cheese, is named after the farm where it was developed at the turn of the twentieth century. I've always been a fan and not just for its alliterative appeal when paired with Hilary but also for its buttery, creamy and slightly sweet flavor. This versatile cheese tastes great on a cracker, wedged between two slabs of bread or washed down with a glass of Sauvignon Blanc. Suz likes it on a panini with thin slices of apple and radish. Yum! So why not mixed in to some mac and cheese? After a bit of internet sleuthing, I came across a recipe called Herbed Macaroni and Cheese on allrecipes.com. While I tend to be a mac and cheese traditionalist, avoiding extraneous mix-ins and foreign additives, the "Herby" spin on this recipe piqued my interest. It calls for Havarti, Cheddar, a small amount of Parmesan and "Italian Seasoning." Now, here's where I must admit I made this dish TWICE. The first time, I read the comments from other cooks who'd previously tested out the recipe and made adjustments accordingly. One cook complained about too much Italian spice, saying it overpowered the cheese. I made a mental note to rejigger the seasoning ratio to avoid the same result and that's where the problem began. As evidenced by previous posts, details are NOT my strong suit. This is a pretty big handicap for a cook and if I were not resourceful, and usually able to fix a recipe on the brink of disaster, I'd have hung up my apron long ago. In this case, I scanned the recipe, and computed two tablespoons along with the words "Italian seasoning." I thought, "Wow that IS a lot. I'll cut that in half." Aren't I smart?? Look at all those herbs! In actuality, two tablespoons was the amount required for Italian Seasoned BREADCRUMBS. Blast! 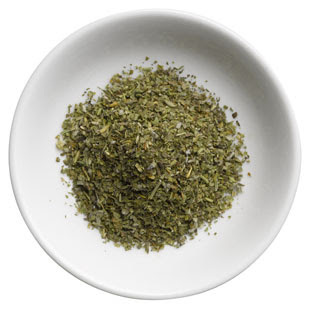 The real measurement for the Italian seasoning was a mere 1/2 teaspoon. Ooopee! Yeah, so that cook, you know the one who thought this recipe was too herby? She would not have liked this ONE bit. I, on the other hand, thought it was kind of a happy accident but it was Hella Herby, no way around it. The Italian seasoning took center stage, turning it into a cheesy pasta dish you might find on the menu of your local Trattoria, though I think you'd be hard pressed to find an Italian Restaurant cooking with Danish cheeses. As you'll see from the recipe below, it's a simple preparation with a short and sweet ingredient list. Pretty standard stuff except for the sour cream, another ingredient I'd never employed in mac and cheese prep however, I'd just used it in The Barefoot Contessa's lasagna recipe (highly recommend) so I had some on hand. One more wrinkle arose when I realized I didn't have any onion powder but I substituted garlic powder because that's how darn resourceful I am. casserole. Bake at 350 degrees F for 15-20 minutes. In the over herbed mac and cheese, it was impossible to discern the cheeses especially the Havarti. The extra sharp cheddar came through but as I said earlier, it was all about the spices. It did have an appetizing creamy, cheesy texture and a delicious crunchy topping. I dropped off a portion to my friend Jason, who likes herby/spicy food, and he gave it a big thumbs up. I did enjoy it but when doing a side by side comparison there was no contest. I invited The Humboldt Fog over for dinner and she deemed this version worthy of Top 5 status. I would have to agree. Without the punch in the face of the Italian spices, the delicate sweetness of the Havarti snuck through the sharp tang of the cheddar and sour cream. Because Havarti is a lighter cheese, we were able to have seconds and not crash on the sofa in bloated heaps. I added three small shakes of Italian herbs and the result was a subtle hint of spice, just the right amount. The sauce was creamy with pockets of crunch and the perfect blending of cheese flavors. One detail I adored from this recipe was the topping. By combining Cheddar cheese, Parmesan and breadcrumbs, I achieved a crunchy top of earth shattering proportions. Not only were the bread crumbs crispy and packed with flavor (I used La Brea Bakery Italian Breadcrumbs), but the Cheddar created an additional cheese crust in between the crunchy crumb bits. Meanwhile, the Parmesan married nicely with those ever present Italian herbs. I will probably employ this cheddar cheese/breadcrumb technique in all future recipes. So there you have it. One recipe cooked twice and go figure, it's best to follow the recipe...if you can. Hey that's a good blog. Danish cow's milk cheese is really very semi-soft & delicious. cheese recipes are yummy! !.Thank you.